Glasgow's famous City Chambers stand overlooking George Square in the heart of the City. The City Chambers are within walking distance of all of Glasgow's main public transport links, and are near the Buchanan Galleries and Italian Centre shopping centres. 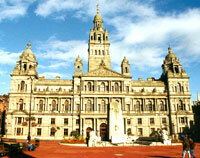 The impressive building was finished in 1888, and ever since then has been the home of Glasgow City Council.